Grey wolves – they can be any colour from black to white – used to enjoy the largest natural distribution of any mammal (except humans!) but they have suffered from human persecution, long-term habitat disturbance and diseases spread by domestic dogs. They live in well-organised packs with a complicated social system, usually with a female as leader. The whole pack travels, hunts and raises cubs together. 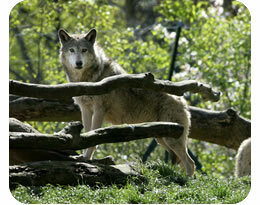 Grey wolves once lived in the forests of Ireland but their habitat was cut down and they were hunted. The last wolf seen in Ireland was a female shot in County Carlow in 1786!